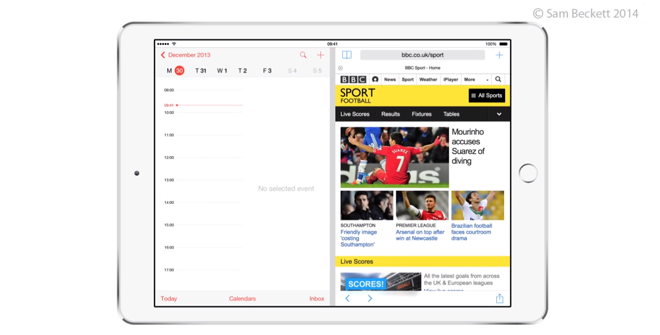 Apple's next-generation mobile operating system may give iPad users the ability to run —and view —two applications at the same time, thanks to new multi-app split screen support, according to a new rumor. The new feature is said to be in the works for "iOS 8," Apple's anticipated next major release of its mobile platform, according to 9to5Mac. The feature has reportedly been designed with Apple's full-size 9.7-inch iPad models in mind, including the iPad Air, but said it's "unclear" whether multi-application support will be available on the 7.9-inch iPad mini. Details on how such a feature might work remain unknown, though it was said that users might be able to more easily drag text, video or images from one application to another. In the early days of iOS, multitasking support was limited to basic background functions for Apple-built applications. True multitasking support didn't arrive until iOS 4, then known as iPhone OS 4.0, which allowed developers to run specific processes in the background. But to date, iOS has only been capable of showing one application at a time, leaving the iPad as essentially a "unitasking" device for viewing content. The ability to view multiple applications at once and "snap" them into place on a limited screen size is currently offered by Microsoft's Surface tablet platform. AppleInsider had the opportunity to test out a Surface 2 last fall, and found that the ability to run two applications on the screen at once was a key advantage over Apple's iPad in terms of productivity. 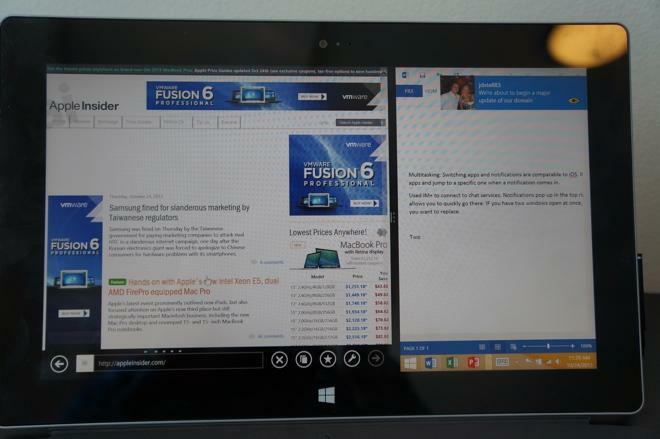 Dual-window multitasking on Microsoft's Surface 2 is limited to only two apps at a time, and is a landscape-only affair. Windows are forced to the left and right of the display, as the 16:9 screen is too narrow to allow multitasking in portrait mode. Apple is expected to officially unveil iOS 8 at this year's Worldwide Developers Conference, which will kick off on June 2 with a keynote presentation. While enhanced multitasking support may be a key feature of iOS 8 on iPad, it's rumored that new health-related functions may be the defining aspect of the next-generation operating system on iPhone. Apple is also reportedly planning to partner with Shazam to build in song recognition to Siri in iOS 8. And the company is also expected to introduce major improvements to the iOS Maps application, leveraging transit data it acquired in purchasing HopStop and Embark. AppleInsider has seen steady traffic from both iOS 8 and OS X 10.10 in recent months, suggesting testing has been underway on both platforms for some time. In its WWDC 2014 announcement, Apple simply said it plans to show off its "latest advances in iOS and OS X" at this year's conference.